Just a short (??!?!) post to let you know we’re back. I just don’t know where to begin… We had a great time! It was, without a doubt, the vacation of a lifetime. Barcelona is an amazing city and we’re very happy we took four extra days to explore it. As this was our first cruise, we’re a little confused as to how we’re going to top this vacation. Talk about traveling in the lap of luxury. You don’t have to do anything for yourself!! Delicious food is available 22 hours a day. Open bar 20 hours a day. Shore excursions that pick you up and drop you off right at the ship. It’s like staying at a 5-star hotel that travels with you on your whirlwind European tour. With 850 crew for 2,100 passengers, you get a lot of personal attention. Click on this link if you’re curious about details of the ship. We had an oceanview with balcony room. The charter company (Atlantis) also went way above and beyond. There was entertainment in virtually every lounge and theater scattered across this huge ship every day from 6PM to midnight. There was a gigantic party on the pool deck every night (DJ, laser shows) from 11PM until 4AM. There were five absolutely out of control theme parties that went on until… well I don’t know when… we gave up at 5AM! Wow! Talk about needing a vacation from your vacation! We met a lot of people and made some good friends. And in Barcelona, before we even got on the ship, we made four new friends from California who were traveling together. We introduced them to our old friends from Chicago (Mark & Keith) who joined us on the cruise and the eight of us hung out together quite a bit, which was fun. I’ll let Roger post a bit about the cities we visited and his impressions, since I’ve been to Italy and Greece before. We took a couple shy of 1,000 pictures total, so I’ll let Roger sort through and post the choice ones. But, I did include one of use on the pool deck while in the port of Villefranche (between Nice, Monaco and Monte Carlo). Oh, and the bit where I said we don’t know how we’ll top this vacation… I lied. 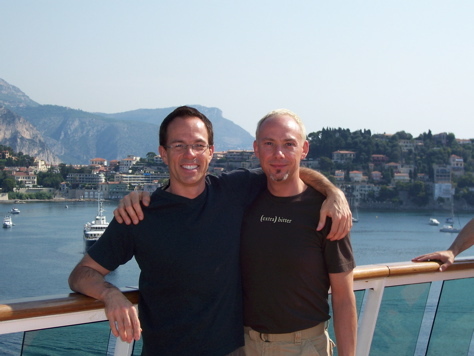 We already signed up for another (gay) cruise in March 2006. Mark and Keith have already gotten about a dozen friends from Chicago to sign up for a Caribbean cruise on what they claim is a nicer ship (not sure how that’s possible… but OK). We know most of them, so it’ll be an absolute blast. Luckily, for our bank accounts, this trip is shorter and closer to home!